I got a nice surprise in the mail last week. A pound of coffee showed up at my doorstep courtesy of my good buddy, a roaster for Gimme! Coffee, based out of Ithaca, NY. Colleen Anunu, who was recently featured in Roast Magazine (May/June ’08), is the roasting manager for Gimme!, where she’s in charge of roasting operations and buying greens, and sometimes gets to travel to cool places. The coffee I received was the Panama (Hartmann Honey), a medium roast that I’ve been drinking every morning for the past week. Kind of toasted and nutty, I know already I’m going to be very sad when it’s gone. Perhaps this gift was secretly a ploy to get me hooked again? If so, it’s sort of working. Now I’m craving all of my old favorites…Damn you Colleen, I’m trying to forget my past! To order some of this amazing coffee you can go to www.gimmecoffee.com, where you can also check out Colleen the Roaster’s blog for coffee updates and insight. To have a cup of coffee expertly prepared for you, grab a cup at one of these locations in NY. 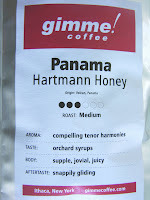 i just had a cup of the Hartmann Honey today. DEEEEEELICIOUS!